“Besser e Schnegg im Krût as gar kei Speck” is an old Swiss saying. In this recipe, cabbage will fill the “Schnegg” (sausage)! And: With no bacon at all! Finely slice the white cabbage, peel the onion and cut into very thin slices. Peel the carrots and grate them. Put everything in a bowl and add the juice from the lemon, olive oil, rapeseed oil and season with salt and pepper. Thoroughly mix everything. Chop up the chilli, dill and parsley and fold into the salad. Let the salad sit for about 15 minutes. 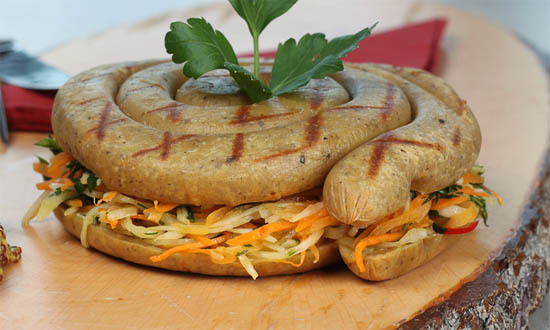 Meanwhile, grill the spiral sausage until golden brown, halve with a sharp knife and fill with the cabbage salad. Serve with fresh bread. Tip: Of course the spiral sausage tastes best when prepared on a BBQ / charcoal grill. But it also tastes great in winter. Just pre-heat the oven (230°) and fry on a grid tray. To add to the taste, we suggest some tasty herb oil, which you should keep dab the sausage with every once in a while. Sweet mustard is also a great supplement!